It was Bank Holiday Monday, raining (of course) so we decided to go to the cinema. They were showing Guardians of the Galaxy 2, what could be better? The cinema was full, but we got there in plenty of time and found our pre-booked seats. I knew it was going to be a good film right from the beginning, when a cute little tree man dances through the opening credits while a war rages around him. The film was visually pleasing, with lots of colour and pretty scenes (makers of Star Wars should take note). Lots of attractive women who were strangely coloured. It made you want to go home and paint yourself green. After about 10 minutes, we were distracted by two elderly women entering the cinema. They carried huge boxes of popcorn and had trouble walking in the dark. They made their way down the aisle, peering along each row, stood for several minutes in the centre, then wandered out again. Perhaps they had wandered into the wrong cinema. Or maybe the cinema is haunted and they were the ghosts from a previous audience. We then got back to the film. Really, the overwhelming impression was pretty, funny, with lots of music. I enjoyed it. Even the spaceships looked like massive sewing machines (not that I enjoy sewing, but it made a change from the normal flying saucer). There was lots of killing, but somehow it’s okay when accompanied by 50’s music. There were a few weird storylines, which felt like they were copied from other sources, and not really developed. But to be honest, the story didn’t matter. It was a jolly sort of film, perfect for watching on a rainy bank holiday Monday. Of course, the day after Bank Holiday was warm and sunny. I tried to brush the dog, who’s moulting like crazy. She hates it, and will stand still for about 2 seconds before running off. 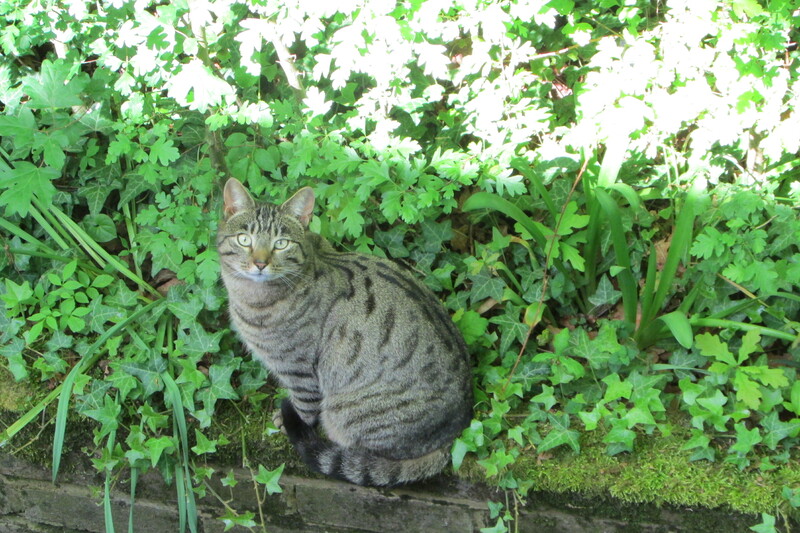 All the cats come to watch – I’m sure they’re laughing at me. I also decided to plant some seeds. I like planting seeds, and am quite good at watering them and watching the seedlings grow. Then I tend to lose interest, so they don’t always make it into the garden. 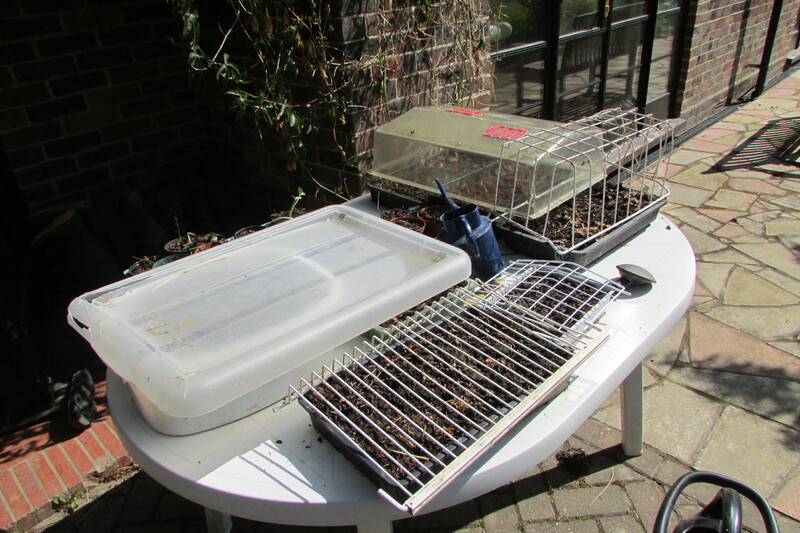 I’ve planted a few pots and trays and put them on the patio – well defended against the cats, who’d enjoy digging them up. Now, here’s a secret, so don’t tell anyone. Next to our house is a field, which is sometimes used for crops and sometimes has animals. 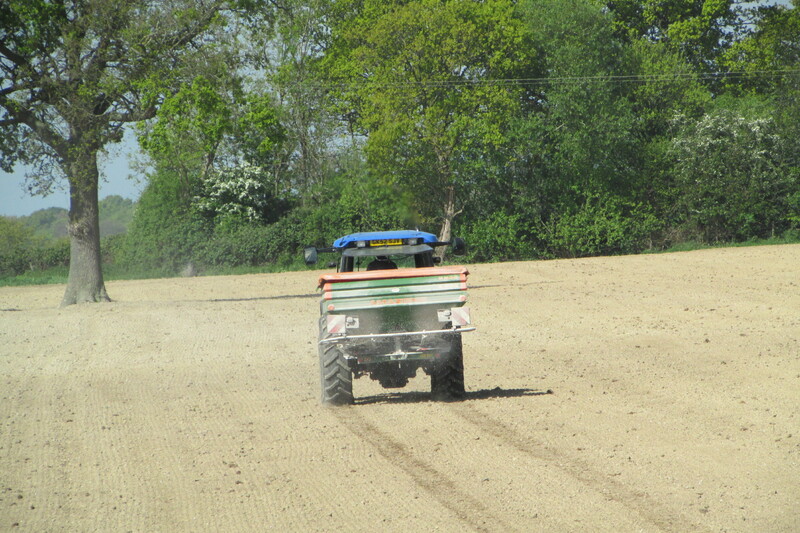 The farmer has recently plowed it, added lots of lime, and drilled it (which I think means he has planted seeds). Last year he grew sweetcorn. 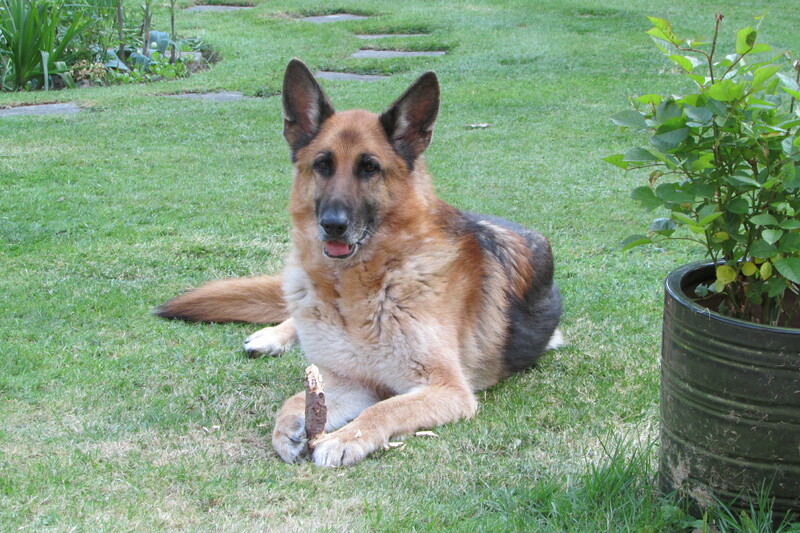 I had some seeds of my own – some sunflower seeds – so, when I was walking the dog, I planted three of them in the corner of the field. Not sure if this is allowed. But if they grow, they will look really good, three sunflowers smiling at everyone in the lane as they drive past. Hopefully they will grow taller than the crop, so everyone will see them. I will let you know. 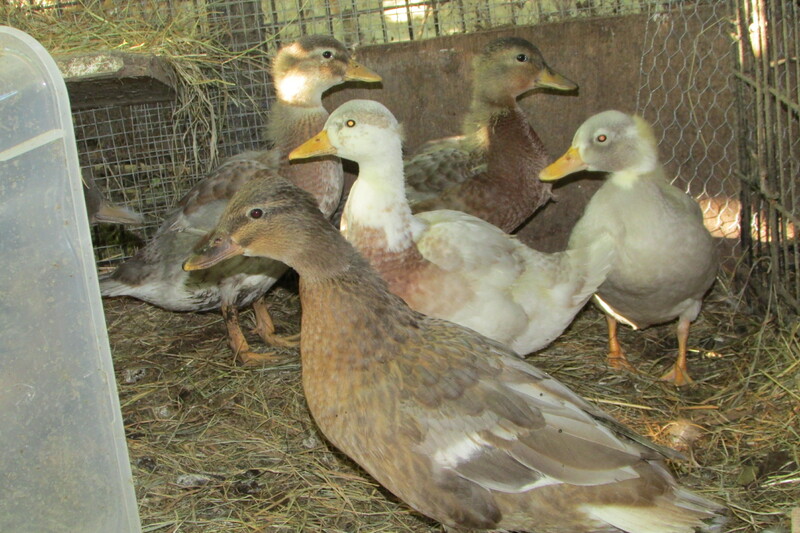 The ducklings have grown as big as their mother. They still have some fluff, but are growing straggly feathers now. When the feathers have grown enough for them to be able to fly, I’ll let them back on the pond. There are another couple of nests around the pond. No idea if the eggs are alive, or if the ducklings will survive should they hatch. Probably depends on whether I manage to catch them or not. 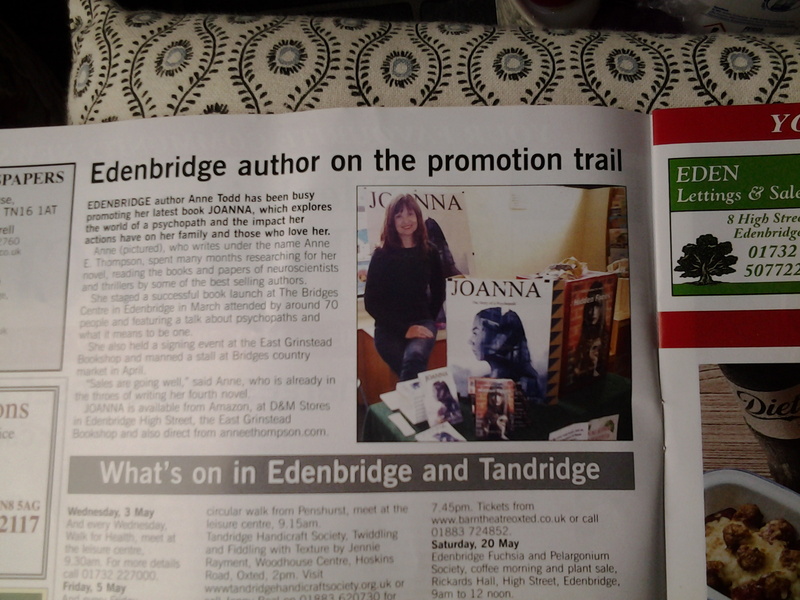 I’ve just been sent a copy of the local paper, which features JOANNA again. The journalists in town have been very kind, my books have been mentioned several times now. I still hate seeing my photo in the newspaper, but I think it’s one of the downsides to being an author. In this one, I am desperately trying to stop the poster behind me from falling down!